You will also need 1 pair of 4mm (UK8 – USA6) Knitting Needles for the main knitting (or the size required to give the correct tension). 1 pair of 5½mm (UK5 – USA9) Knitting Needles for casting on and off (or a needle 3 sizes larger than you use for the main knitting). Don’t worry too much about the tension of your knitting for this project - most accessories can stand to be slightly bigger or smaller than intended. This wrap has been pinned out under quite a lot of tension as part of the finishing process. Doing this opens up the fabric beautifully and really shows off the stitch patterns. Once pinned out to (approximately) the sizes we’ve given, you can either gently steam the work or cover it with damp cloths and leave them in place until they are dry. Whichever way you choose to finish your work, it will be transformed by the process. Yfwd bring yarn to front between needles then take yarn over the top of the right hand needle to form a stitch. Using your larger needles and thumb method cast on 83 sts loosely . Change to your main needles and work in stocking stitch for 10cm, (4in), finishing after a ws row. 1st Row. (this will be the right side of work – rs ) K19, (s1, k1, psso, yfwd, k4, k2tog, yfwd, k1, yfwd, s1, k1, psso, k3) 3 times, s1, k1, psso, yfwd, k20. 2nd and every Alternate Row. Purl. 3rd Row. K20, (yfwd, k2tog, k2, k2tog, yfwd, k3, yfwd, s1, k1, psso, k3) 3 times, yfwd, k2tog, k19. 5th Row. K19, (s1, k1, psso, yfwd, k5, yfwd, s1, k2tog, psso, yfwd, k4) 3 times, s1, k1, psso, yfwd, k20. 7th Row. K20, (yfwd, k2tog, k3, k2tog, yfwd, k1, yfwd, s1, k1, psso, k4) 3 times, yfwd, k2tog, k19. 9th Row. K19, (s1, k1, psso, yfwd, k3, k2tog, yfwd, k3, yfwd, s1, k1, psso, k2) 3 times, s1, k1, psso, yfwd, k20. 11th Row. K20, (yfwd, k2tog, k4, yfwd, s1, k2tog, psso, yfwd, k5) 3 times, yfwd, k2tog, k19. From 1st to 12th row forms the pattern. Work 360 rows more in pattern. Work in stocking stitch for 10cm, (4in), finishing after a ws row. Cast off loosely using your larger needle. Pin out wrap to the measurement given and cover with damp cloths until dry. See ball band for washing and further care instructions. I certainly have and had wondered for years why it wasn't available to buy off the roll. So here at Minerva Crafts we set about finding it and have brought you three different types, all of which are the perfect finishing touches for your stretch fabrics - you may have seen some of them being used in episode 3 of series 2 of the Great British Sewing Bee TV programme. In the photos below I have shown you a sample piece of each of the three different types of Stretch Jersey Bias Bindings we stock. This is my favorite stretch bias to use. It is a knitted 100% cotton jersey bias and lends itself beautifully to cotton and viscose jersey fabrics. It is beautifully soft and will drape well with your soft drapey jersey fabrics. Our satin stretch bias is the ultimate, luxury finishing touch. Made from 100% polyester, this bias has a beautiful finish with a subtle shine - perfect for adding edges to garments for special occasions or on fabrics with a satin finish. This is our lycra stretch bias. This is the most economical bias in the range and as the name suggests, it is superb for using on lycra fabrics and is perfect for finishing leotard's! I cannot recommend stretch bias binding enough! It is a fantastic product that enables you to bind stretch fabrics with a professional looking finish - a binding that will stretch with your fabric. It opens up so many more possibilities with all your stretch fabric sewing projects! When did you start sewing and what inspired you to start? I started sewing as an adult about 7 years ago. I was taking a fabric screen-printing class, and I wanted to make something with all the designs I was printing. Before that I was strictly a knitter. It was very simple bag based on the ‘Jordy Bag’ tutorial from Craftster. A legendary tutorial from THE big internet sewing hub back in the day. I learnt a lot from that forum! What do you love most about sewing? What made you decide to start blog about your sewing? When I started sewing there were hundreds of knitting and quilting blogs, but hardly anyone was writing about sewing. I remember googling for a Peter Pan collar tutorial and getting one measly result (try doing that now!). Then all of a sudden around 2007, the dressmaking community online exploded, with loads of new blogs springing up. I crammed my Google Reader full of every blog I could find, and learnt so much about sewing and new patterns and new techniques. Eventually I thought I might as well join in. How are you liking being part of the Minerva Crafts Blogger Network? It’s completely brilliant! When the parcel with my projects arrives it feels just like Christmas. Thank you Minerva! Wonder Tape, which is double sided fabric tape that dissolves in water. I can’t sew without it. It’s the lazy woman’s answer to basting.A sewing gauge, I only got it last year and I’m not sure how I managed before.My overlocker, which is a Brother 1034D. It makes seam finishing and knits so ridiculously easy. God I love it. I love sewing with rayon and drapey crepes, because the result always looks so professional and RTW. I do like cotton for tops, but it creases so much on skirts that it drives me mad. I’m also a big fan of sturdy knit fabrics, like ponte and double-knits. They are so forgiving for fitting, but still have lots of structure. What/who do you go to for inspiration before you start sewing? I have a Pinterest board (http://www.pinterest.com/kathryngr/clothes-and-that/) where I pin clothing with interesting details and colours, it’s a brilliant reference tool. I get lots of inspiration from sewing blogs too. I love the style of Four Square Walls (http://foursquarewalls.blogspot.co.uk/) Handmade by Carolyn (http://handmadebycarolyn.blogspot.co.uk/) Crab & Bee (http://crabandbee.com/) What Katie Sews (http://whatkatiesews.net/), Charity Shop Chic (http://charityshopchic.net/), and lots of others. I also spend hours browsing Net-a-Porter and mywardrobe.com to see what kind of details RTW garments have. It’s easy to sew something that you would never actually wear, and I’ve made my fair share of these garments. So I’m trying to think about my style in a more considered way this year. Are there any other crafts that you enjoy doing other than Sewing? I still enjoy knitting although I am extremely slow. It has one key advantage over sewing in that you can knit while watching TV. I took a foundation course in textile art a few years ago but hardly ever do any drawing or arty stuff now, I’d love to get back into it. Are there any other crafts you would love to learn? One day I will learn to quilt, if only to start using up the mountain of scraps I have accumulated. However, I suspect quilting would actually mean acquiring many MORE fabrics for my stash, so I’m putting it off for now. As you have inspired many others in the past to start sewing through your blog and Social Networking sites, what would you say to other potential sewers who may want to give it a try? I really, really hope I have inspired people. I’d say to any new stitchers that sewing isn’t easy, but it is massively rewarding. Also, the things you make will never match up to the vision in your head, but that’s okay. It’s all about trying to close the gap a bit. Could you sum yourself up as a sewer in 3 words? - What led you to set up your business? 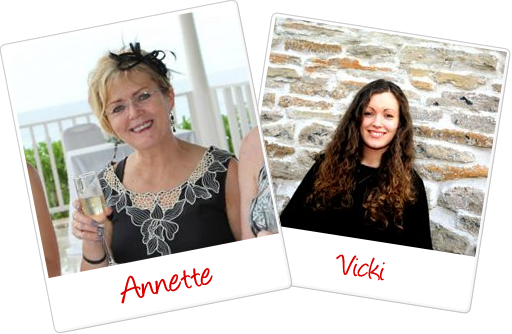 (Vicki) The company was founded by my mum Annette with the support of my dad Phil. My mum has always been a fanatical knitter, dressmaker and embroiderer which is what inspired Minerva Crafts. I have lots of memories of my mum sewing and knitting when I was a young child and I was always encouraged to join in and make things. - How long has it been running? (Annette) We opened in 1998 - so we have worked together for almost 16 years now! There have been a lot of changes in that time. We started off as a traditional needlework shop in Lancashire and over the years we have expanded into so many more ranges including 1000's of fabrics, sewing patterns, haberdashery, knitting yarns, crochet supplies, card making, and so much more that we need a 24,000 sq ft warehouse and shop to fit it all in! - How did you two come to work together? (Vicki) It started when I was young. My mum would be working in the shop on Saturdays and my dad always took my younger brother to football, so my Grandma used to babysit for me. One week she couldn't, so my mum took me with her to work. From that day on I was hooked and went to 'help' out at the shop every week without fail. As young as I was at 8 years old, I remember priding myself on being able to help customers. I loved everything about the shop. I worked every Saturday and summer holidays and then when I started going to secondary school I even went down on the bus every night to help out. - What's it like working with Vicki? (Annette) Vicki absolutely loves her job and it shows. She is probably the most enthusiastic, driven, dedicated person you could meet...definitely a workaholic. She pushes the business forward with so many exciting ideas and new initiatives and it is a pleasure to work alongside her - most of the time anyway! - And what's it like working with Annette? (Vicki) I count myself as one of the luckiest people in the world. I have a job that I love and I get to work alongside my family every day. Some people would hate this, but I love it. I have always been really close to my mum and we have a really great working relationship. I wouldn't change working with her for the world. - Is it hard leaving the business behind when you go home? (Vicki) It really is. When you have so many ideas buzzing around in your head it is almost impossible to go home and not continue working. My mum is better at this than me and does manage to shut off every now and then. I will get there one day. I'm lucky enough to consider my job as my hobby so much of the time it doesn't really feel like 'work' anyway! - Who's responsible for what at work? My mum takes care of the Minerva Craft Centre store and is our resident craft blogger! I look after the online side of things. It works out well as I'm more technically minded than my mum is, and she is great in helping customers face to face and giving knitting and sewing advice. - Who's the bossy one? - What's the secret behind working with your mother/daughter? (Vicki) Its quite hard to say really. Because I have always worked with my mum I suppose I don't really know anything else. I think if you both have the same drive, motivation and the same principles, then you will succeed. - Do you ever feel you need a bit of space, working in such close proximity to one another? (Annette) Not really. You do get some days where we can be a bit stressed and wish the days were elastic so you could fit in everything you need to do, but its not often I feel I need space from working together. - How do you separate work and home life? (Vicki) Not very well! Our hobbies are sewing, knitting and a lot of other crafts, so even when we have some down time, in effect we are still working as we share all our personal projects on the Minerva Crafts Blogger Network on our website. - Has working together changed your relationships with one another? Has it made you closer? (Annette) I would say it has made us closer. We spend so much time together that if we didn't get on really well then it wouldn't work. - What advice do you have for other mother-daughter business teams? (Vicki) You have to both love what you do and be equally committed and focused. Even though you work together, you don't have to be in each others pockets every single day. Share the tasks between you that need to be done so each person has their part to play. - What crafts do each of you do? (Annette) I have enjoyed knitting and dressmaking for over 40 years and these are the two crafts I always come back to. I do enjoy a spot of crochet and cross stitch and have recently got into needle felting! (Vicki) When I was younger I was lucky enough to do a BTEC in textiles at college, a degree in embroidery at Manchester Metropolitan university and then a masters degree in Design, so I have been lucky enough to be able to try so many different crafts and really push the boundaries with what you can do with different techniques and processes. Nowadays I still love hand and machine embroidery, but I also love Knitting and Sewing. My mum is such a good knitter and dressmaker so she is always on hand to help me develop my skills and learn new things! - Whose idea was it to do the workshops? Who do you get involved to run them? (Annette) It was a joint decision really. The Minerva Craft Centre is such a huge space (approx 5,000 sq ft) that it would have been a shame not to introduce a workshop program and craft groups. We have had a great response to them over the last couple of years, so much so that we now run 3 Minerva Craft Group meet ups every week! We run two crochet workshops alternatively every week and these are run by two fantastic ladies - if you don’t catch the crochet bug off these two I don’t think you ever will! - What's your Mother's day message to your mum? (Vicki) The best way to show you care is always with something handmade. I know my mum always really appreciates anything I have ever made for her. I will have to think of something special for Mothers Day. - What's next for Minerva Crafts? (Vicki) We are always working to improve our service, grow our product range with new and exciting lines and develop our website, and this will continue in 2014. Last year we launched the Minerva Craft Club and it has been an exciting development for us which rewards our regular customers old and new with great savings, a free membership to our Swatch Club and a VIP invitation to the Minerva Craft Club Christmas Party in December and Minerva Crafts Meet Up in June. We have had such an amazing response so far and we would like to take this opportunity to thank everybody who has signed up.